When you begin to remodel, keep in mind there are virtually no limits regarding color. Although white and beige have dominated bathroom décor for decades, bright colors are now making a comeback. The use of several colors is also an option you should consider. As long as you do not use more than three primary colors–which could make the room look too busy– adding several bright shades will completely revive your bathroom’s interior. 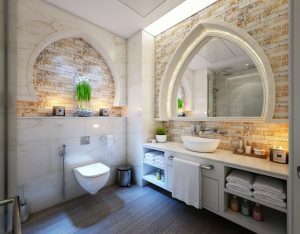 You can also breathe new life into an old bathroom through the use of a rain forest shower head, vessel sink or fancy lighted mirror. A claw-foot vintage bathtub is a great choice if you are searching for something unique as the focal point of the room. Replacing stainless steel fixtures with those featuring bright colors or eco-friendly bamboo is a great way to update the look of your bathroom as well. If your bathroom is spacious, consider adding a sauna or steam bath to transform the area into your own relaxing sanctuary. A shower and bathtub with Jacuzzi jets is also a great idea. A luxurious bathroom must include a place in which to relax. For this reason, you should consider adding some furniture to the room. An upholstered chair or small padded stool are both good choices. If the area is large enough, a sofa or armchair may be ideal. Waterproof furniture is now available that is specifically designed for bathrooms, so you need not worry about mold or mildew. Always organize in advance, as careful planning ensures the remodel will go smoothly without any unexpected surprises. Renovations of this type are an ideal way to add value and beauty to your dwelling for many future years. Contact us for an estimate today!